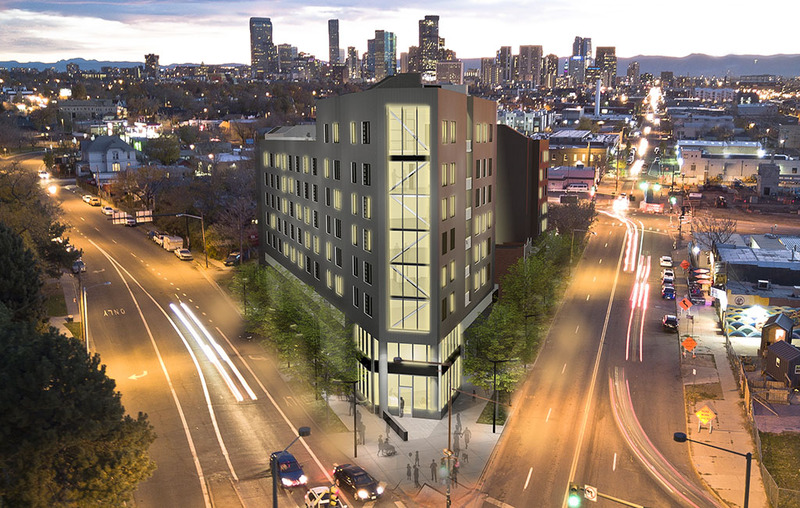 A group of local developers wants to build a hybrid residential complex in RiNo, with 161 units renting for as short as a night or as long as a year. Peak Development Group, Slipstream Properties and Kaplan Companies want to build the yet-to-be-named eight-story project at 3718, 3722 and 3724 Walnut St., a short walk from the 38th and Blake light rail station. Some floors would have units rented on a nightly or weekly basis, the companies said. Units on the remaining floors would for more long-term tenants. The units would be a mix of studios and one bedrooms, ranging in size from 350 to 650 square feet. “We think we deliver the best of both worlds, a true hybrid experience that falls in the grey area between apartments and hotels,” Ellington said. Plans for the site still need to be approved by the city. The three firms purchased the 0.32-acre triangular parcel at 3724 Walnut St. for $2.1 million in June. The parcel includes a two-story building, constructed in 1890, that the developers plan to preserve, with the new construction flanking it on both sides. Last month, the companies spent another $1.1 on two adjacent parcels, 3718 and 3722 Walnut St., which feature a single-family house on 0.2 acres. The sellers, Conrad and Kathy Nuanes paid $130,000 for the property in 2002, according to city records. The house would be demolished for the new development, which is slated to include a second-floor parking deck and 6,500 square feet of community space. Planned amenities include a ground-floor and rooftop bar, a fitness center and concierge and housekeeping services that can be utilized by both short-term guests and apartment tenants. The area around the 38th and Blake station is set to see dramatic changes in the coming years. Across the street from the proposed development, Medici Consulting Group wants to construct the 65-unit Walnut Street Lofts project on land owned by the nonprofit Urban Land Conservancy. Behind that, McWhinney wants to build a 16-story, 347-unit residential complex. The other side of the intersection, meanwhile, is the site of the proposed World Trade Center Denver complex. Plans call for a hotel, convention center and coworking and traditional office space.